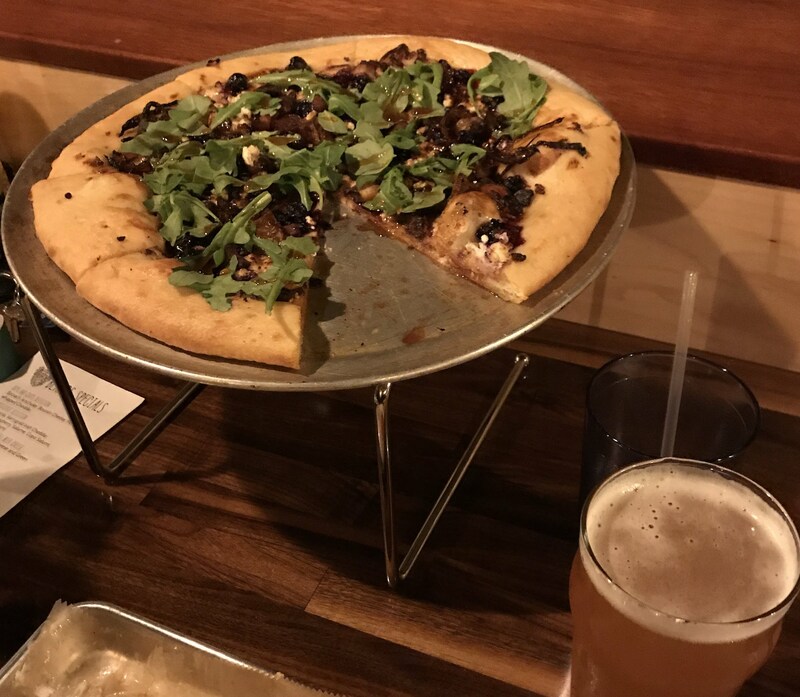 Following a growing trend, Unruly Brewing Company plays host to Rebel Pies in its taproom in downtown Muskegon, providing a family friendly atmosphere for both craft beer and pizza lovers. Since my first visit to Unruly, I have made many of my family and friends into believers that it is worth making the trip here to taste this mouth-watering pizza and beer. Unruly’s tapboard features a nice variety of craft beers, cider and wine, making it a great place to go with both those who share a love of craft beer and those who don’t. 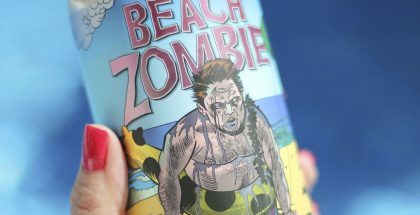 A personal favorite has been the Tropic Thunder Imperial IPA (8.4%), a heavier, hoppy beer with tropical and citrus notes. During the spring and summer, I have also enjoyed the Orange Julius Belgian Wheat (5.8%), which is on the sweeter side as it is brewed with orange peels, whole vanilla beans and lactose. In regards to the pizza, personal favorites have included the Veggie Bomb, which is loaded with meatless flavor for my vegetarian friends, and the Thai-One-On, which features Thai chili peanut sauce, roasted chicken and more. However, the biggest crowd-pleaser by far has been the Polynesian Farmer (featured second from the top in the picture below). This pizza provides a twist on the traditional ham and pineapple, as it features prosciutto, goat cheese, bacon, pineapple rings and sriracha sauce. IT IS SO YUMMY! The Mitten Brewing Co.‘s original location in Grand Rapids is worth the visit simply because it is located in what was once the historic Engine House No. 9 of the local fire department. The Mitten’s founders restored the beauty of the original building, and old photos from the engine house can be found throughout the two levels. I have to admit that this location also holds a special place in my heart, as my husband and I had our second date here, and we were later able to have our engagement photos taken on the upper level (see photo below courtesy of Samuel Marz). When the weather is warm, it is nice to visit the Saugatuck and Northport locations, which offer outdoor seating with views of the Kalamazoo River and Grand Traverse Bay, respectively. 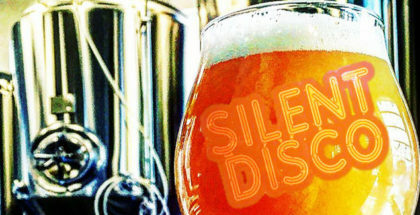 In addition to a wonderful ambiance, The Mitten tops our list of the best craft beer and pizza combinations in Michigan. 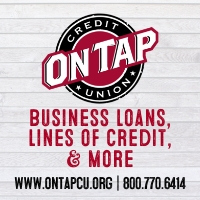 My typical order is either the Country Strong IPA (7.2%), a crisp American IPA with traditional hoppy flavors, or the Label Up (6.5%), a dark brown ale that features the flavors of pecans and maple syrup. If you are visiting for the first time, I highly recommend doing a pizza flight for dinner, which allows you to sample six different specialty pizzas from the menu. My top choice is the Field of Greens, which is topped with pesto and a pile of veggies, while my husband would vote for either The Heater (habenero sauce, sausage, jalapenos, banana peppers, etc.) or the Thai Cobb (either shrimp or chicken, broccoli, shredded carrots, peanuts, red curry sauce, etc.). For something totally unique, try the Strawberry Fields (strawberries, bacon, onions, etc. on a balsamic base) or the Chicken and Waffles (Chicken and waffles on a butter base, drizzled with maple syrup). See why you need to try the flight?? If you find yourself further north on National Pizza Day, Beards Brewery is the place to be. My husband and I discovered Beards while on our first camping trip together, and we enjoyed it so much that we went there twice in one weekend! Beards is located in downtown Petoskey, and if you sit upstairs, you will be able to enjoy views of Little Traverse Bay while savoring some of the best craft beer and pizza in Michigan. Oh! The Citranity! (4.9%), a light pale ale, was refreshing and crisp with notes of citrus and grapefruit. We also enjoyed trying Owlmadillo (7.5 %), an American IPA with amarillo and mosaic hops, and Pomegalactic, an experimental and seasonal American IPA with a unique pomegranate and tropical taste. Because we visited Beards twice, we had the privilege of trying two of their delicious pizzas. On the first night, we enjoyed their special, which was a to-die-for blueberry barbecue pizza. It featured blueberries, feta cheese, bacon, etc. on top of a blueberry barbecue sauce, and it was surprisingly AMAZING. Unfortunately, it was a seasonal special, so most likely it will not be available for your National Pizza Day celebrations. However, I can suggest an equally delicious alternative: The Sweet & Spicy. 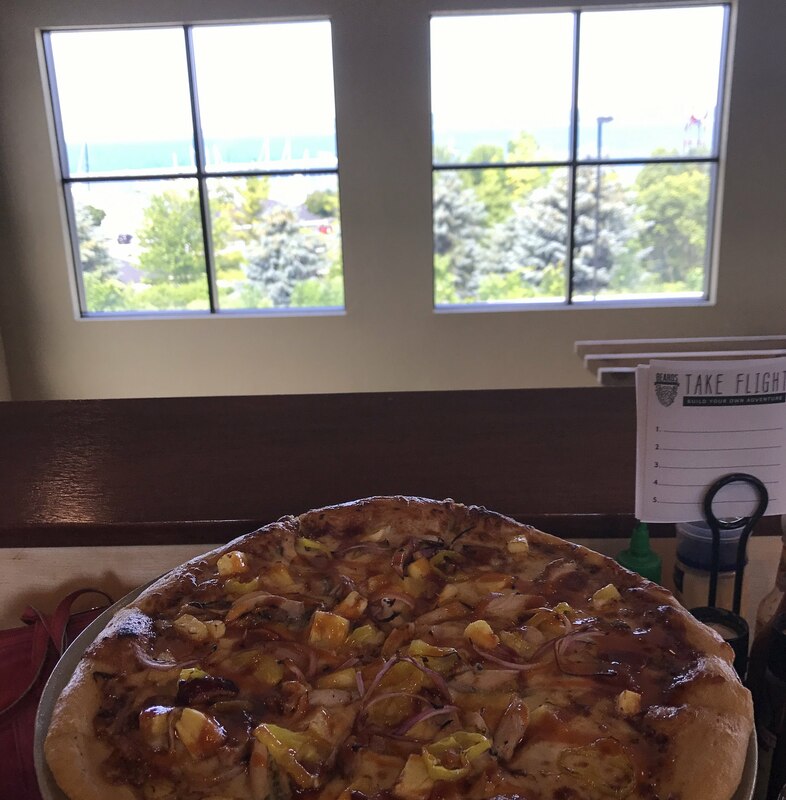 This pizza gem is topped with chicken breast, pineapple, red onion, banana peppers and a house-made Luna-Apple-BBQ-Sauce. With the beauty of the Little Traverse Bay looming in front of you, Beards’ craft beer and pizza combination is tough to beat! With locations scattered throughout Michigan (Detroit, Ann Arbor, Grand Rapids, Traverse City and more), chances are you will find yourself close to a Jolly Pumpkin Artisan Ales when National Pizza Day rolls around. 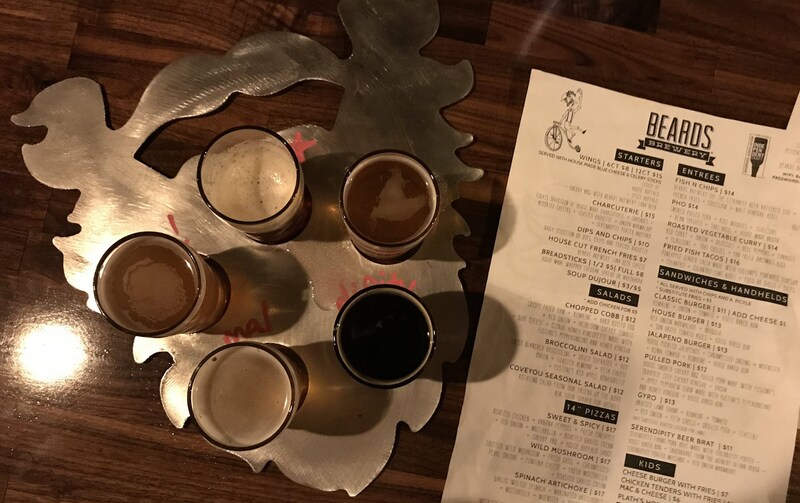 I originally discovered Jolly Pumpkin while living in Ann Arbor, but grew a new appreciation for it while on a beercation with my husband in Traverse City. Now, we are lucky to have one close to home as well! 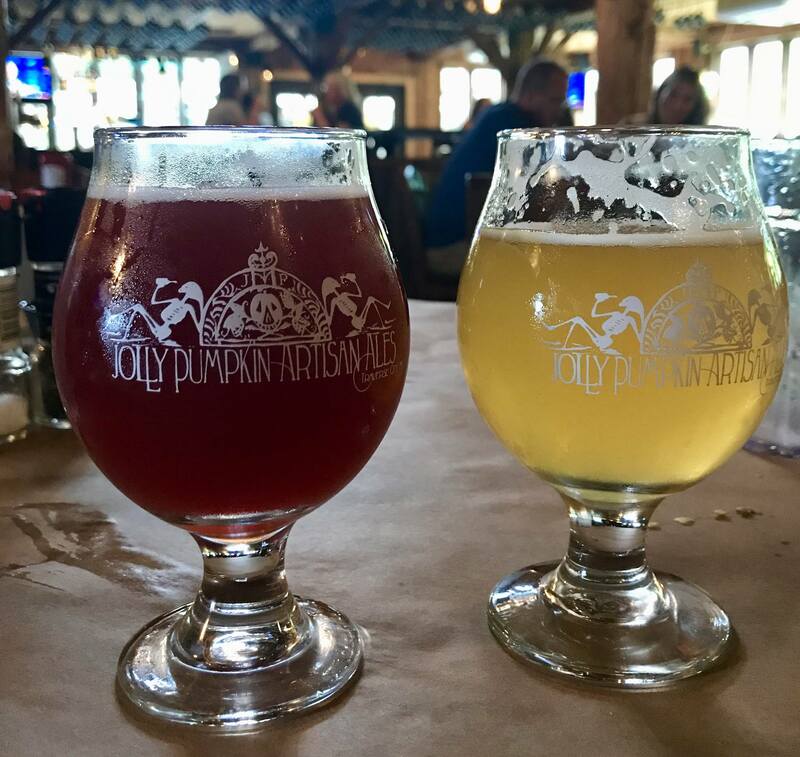 If you are in the mood for something different than your usual IPAs and ales, Jolly Pumpkin is the place to go as they are known for their sour beers (but have no fear, they do brew two IPAs called Poetic Pestilence and Pure Speculation for the non-sour fans). My husband and I enjoyed La Roja (7.2%), a sour amber ale, and Oro De Calabaza (8%), a sour artisan golden ale, while we were visiting in Traverse City. Both were refreshing on a hot summer day, and provided a nice change to our usual craft beer routine. When it comes to pizza, Jolly Pumpkin’s menu features a variety of artisan flavors ranging from the more unusual (the Bridge Street Vegan pizza at the Grand Rapids location features hummus, kale chips, and more) to the traditional (Pepperoni or Margherita Pizza for those who like to keep it simple). My personal favorite is the Truffled Mushroom Pizza, which is loaded with tasty shiitakes, creminis, goat cheese, truffle oil, arugula and more. This creamy pizza will melt in your mouth, and it pairs nicely with any sour beer you might indulge in from the menu. At two locations in Grand Rapids (Harmony Hall on on the west side and Harmony Eastown), Harmony Brewing Company is serving up wonderful wood-fired pizzas to pair with their tasty variety of craft brews. Featuring similar menus with a few unique items at each location, the new west side location has an open and industrial-feeling while Harmony Eastown provides a cozy, neighborhood atmosphere. 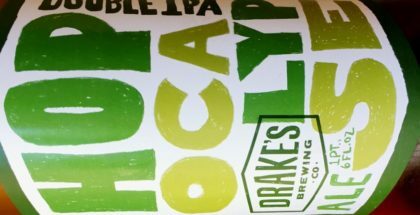 For an excellent craft beer and pizza combination, I recommend the Luscious Lyon IPA (7.5%), which is compared to a New England Style IPA with its notes of tangerine and papaya. If you prefer a darker beer, the Black-Perle (5.8%) is a full-bodied stout with the subtle taste of sea salt. 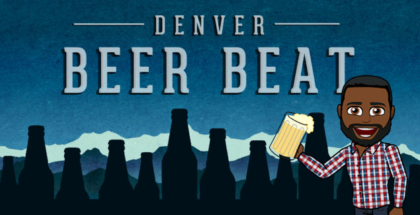 Of course, any beer will pair well with the savory pies served here. Some of the more unusual options at the German-inspired Harmony Hall include German Potato Pie (sour cream sauce, potatoes, ham, onion) and The Stockbridge (beer mustard, cheese, Polish sausage and kapusta). One of the Eastown specialties (and my personal favorite) is the Eastown Folk Funk 2000, which features pesto, bacon, charred artichokes, feta cheese and arugula. The best part is, if you live in the area and find yourself snowed in on National Pizza Day, Harmony will deliver both its pizza AND beer right to your house! Now, you have no excuses NOT to celebrate with us on February 9th! If you have read any of the other posts I have written about Michigan beer, you have probably learned that I am very loyal to my home-town brewpub, New Holland Brewing Co. Because I frequently mention NHBC, I was going to leave it out of my top 5 pizza and beer recommendations. However, it is just too difficult for me to talk about craft beer and pizza and not even mention the delicious combination represented at NHBC. Although there is now a newer location in Grand Rapids (The Knickerbocker), I continue to be partial to the Pub on 8th Street. Almost once a week, my husband and I find ourselves enjoying some of our favorite brews here such as Hoptronix (a strong, slightly dank Double IPA at 9%) or Tangerine Space Machine (a 6.8% New England IPA with a haze of tangerine). I am also excited to try Kombucha IPA, an IPA with kombucha, lemon and ginger flavors, and Cerveza Con Limon, a light Mexican lager with a hint of lime, which will be released this spring and summer. In regards to the pizza, my husband and I are in a constant war of whether we will share the Portobello Mushroom Pizza (my choice due to the delicious combination of spinach, mushrooms, peppers, and goat cheese) or the BBQ Chicken Pizza (his choice due to the spicy addition of jalapeño and pepperdew peppers). We often share an order of Pepperoni Pinwheels as well, which are a must-try if you have not been to NHBC before. If you are at New Holland for National Pizza Day, chances are high that we will see you there! And if you have any recommendations for where I can find some of the best pizza and beer in Michigan, please let me know- we are always looking for a new beer-inspired adventure! Cheers!